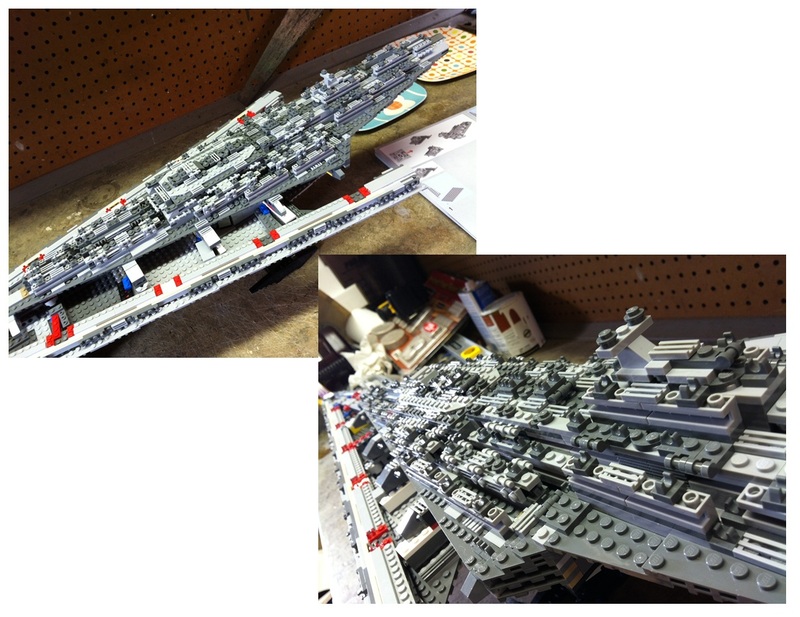 e have hit the “Lego-stage” in our household… with a vengeance. 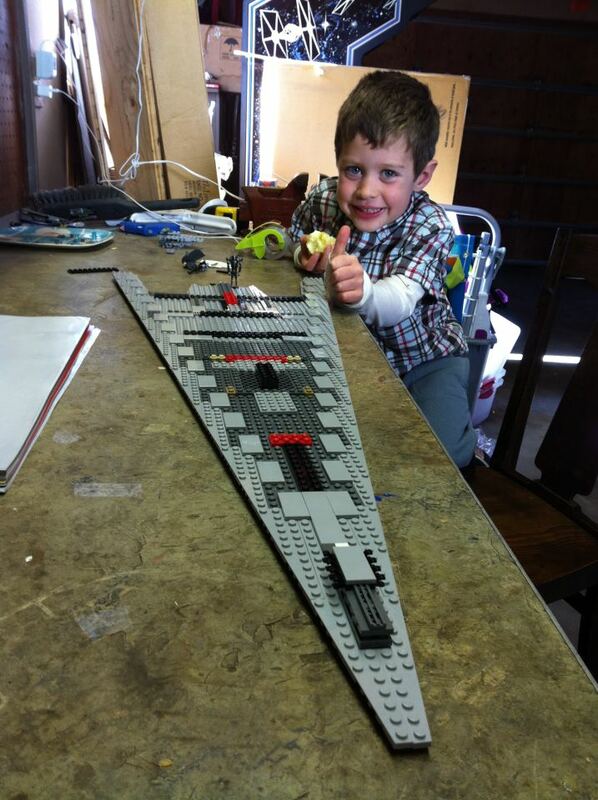 Ask the kids what the big-ticket items are on their birthday/Xmas wish lists and they’ll tell you “LEGOS! !” It started out innocently enough with the smallest little set, Gandalf riding on his little horse-drawn carriage from The Lord Of The Rings. Who would have known that was the gateway drug that would turn my children into full-on Lego crack-heads? In only a few months’ time we have gone from one little Gandalf set to shelves overflowing with Technicolor bricks, organizers filled to the brim with last week’s epic creative marathons, and a floor littered with choking hazards in every corner (Episode VI always manages to find the ones we miss). 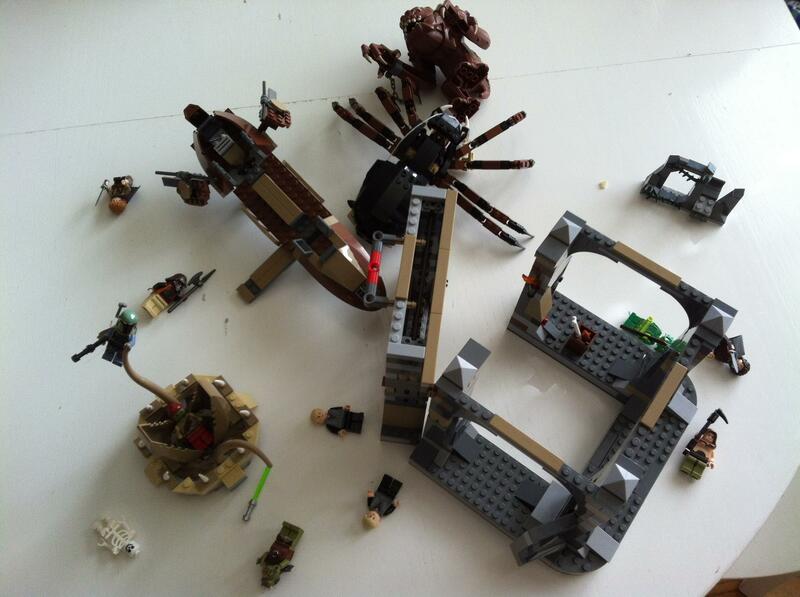 Epic battle between Lego Rancor, Lego Saarlac and Lego Shelob. And if you’re really doing it right, there’s the incredible quality time you get to spend with your children. 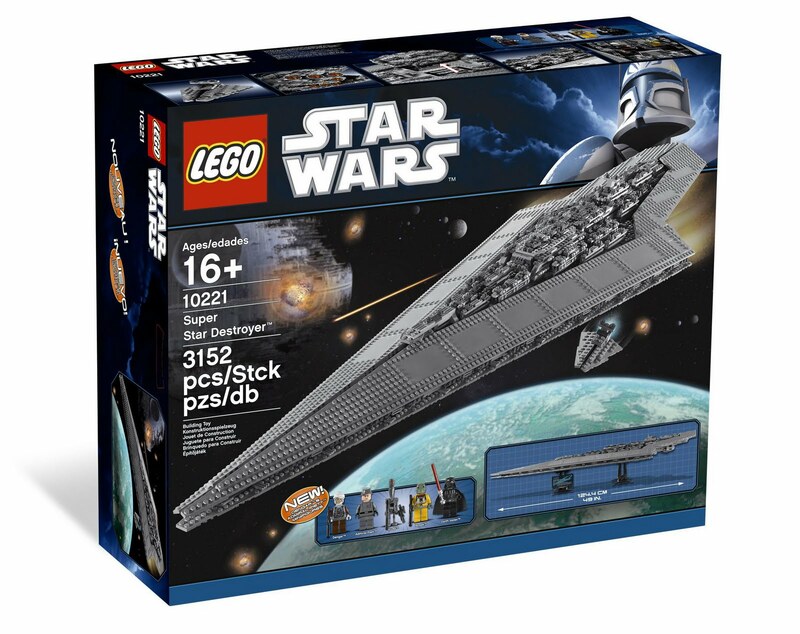 Recently I indulged myself, and purchased over Ebay (‘cause there was no way I was going to spend the $400 retail) the penultimate Lego set currently on the market, with the intention of slowly working it through with my son (and daughter, if she wanted). 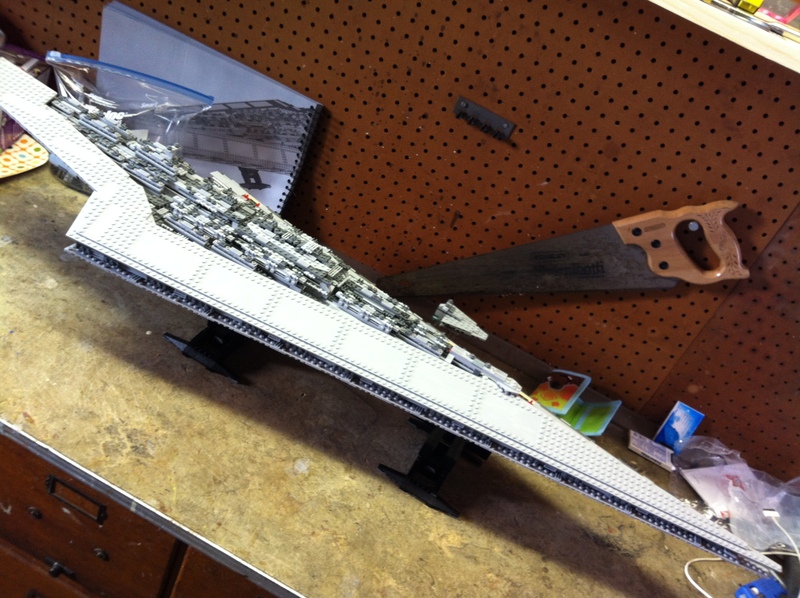 At more than 3000 pieces and more than 49 inches in length (longer than my son) the Lego Star Wars Super Star Destroyer is currently the most involved, intricate, high-level Lego set you can buy. Given the fact that Lego suggests it is for ages 16+, obviously a project like this is beyond the scope of a 4-year-old. But after he tore through all his Xmas Legos in less than a week like Dustin Hoffman counting toothpicks, I knew (under my guidance) he was ready for a project like this. 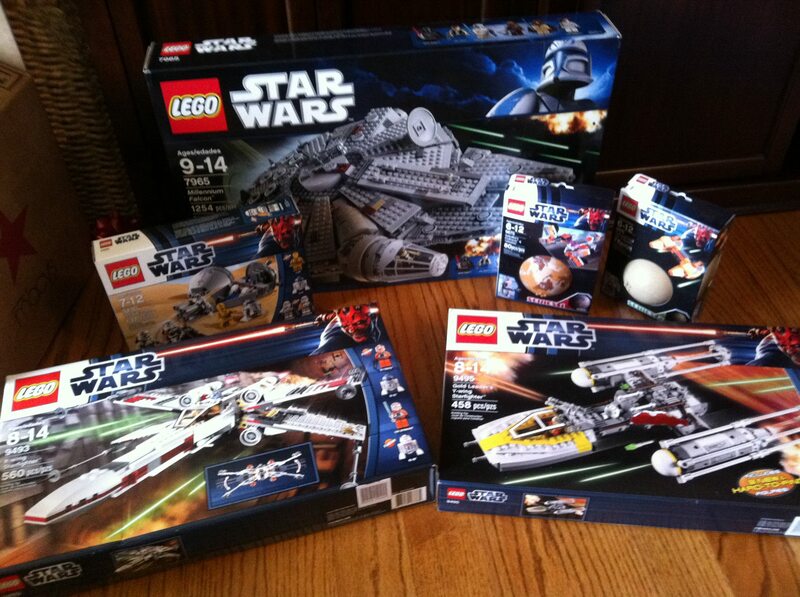 Episode V’s Xmas Lego haul. It took him less than a week to finish all of them. I told the kids about the project, got ‘em all amped up by showing it to them on the internet, and then waited for the package to arrive. I managed to get the on Ebay for ½ the retail price, with the knowledge that it was missing at least one bag of bricks (7 total steps, each ranging from 3-5 bags of 150 pieces). I took a calculated gamble, knowing that I could use Lego’s brickfinder site to fill in whatever blanks came up. If worst came to worst and we couldn’t finish the project, I bought the kids 3000+ bricks to indulge their creative impulses as their hearts saw fit. I’m glad to say we made it all the way through, with only two hiatuses to order missing parts (spent more shipping the parts than I did on the parts themselves). I made an effort to make sure that Episode IV was invited to participate as much as she wanted. She dropped in here and there to help, but she isn’t the Star Wars nut that my son and I are. She’d rather spend all that time drawing pictures and writing stories. Given the fact that the Chief Engineer of this project was a 4-year-old, the entire effort stretched out across a couple months. If he was 16+ it would be easy to imagine a 14-hour marathon fueled by Red Bull (horrible for your teeth) and pizza. But at this age there’s an attention-span factor. He’s 4 years old. We’re lucky if he gets 1 of two socks on by himself before “Oh look, something shiny.” But where this project was concerned he and I regularly sat down for a solid hour, uninterrupted. Try go get a 4-year-old to focus on ANYTHING for a solid hour. The experts will tell you it’s impossible. Apparently all it takes is a Lego set. But the real benefit of this project, more than the developmental skills he grew, was the priceless father/son time. We must have spent 20 hours out in the garage on this thing, just *BEING* together -sharing space, talking, working together. When people say “quality time”, this is what they’re talking about. When we stated I would put my iPhone up on the shelf and stream NPR just to have some semi-intellectual background noise. But when the broadcast turned to Afghanistan I switched over to Pandora. During all those hours we spent alone together in the garage, we spent a good portion talking about The Rolling Stones, The Beatles, Steve Miller Band, Credence Clearwater Revival and 80’s hair bands. Those things are arguably just as important to his education as current events in Afghanistan, and much more age-appropriate. There came the day we knew we were going to finish. We’d spent a good portion of Friday afternoon leading up to it, and Episode V was up bright and early on Saturday morning peeking through our bedroom door at 6:30am “Daddy? 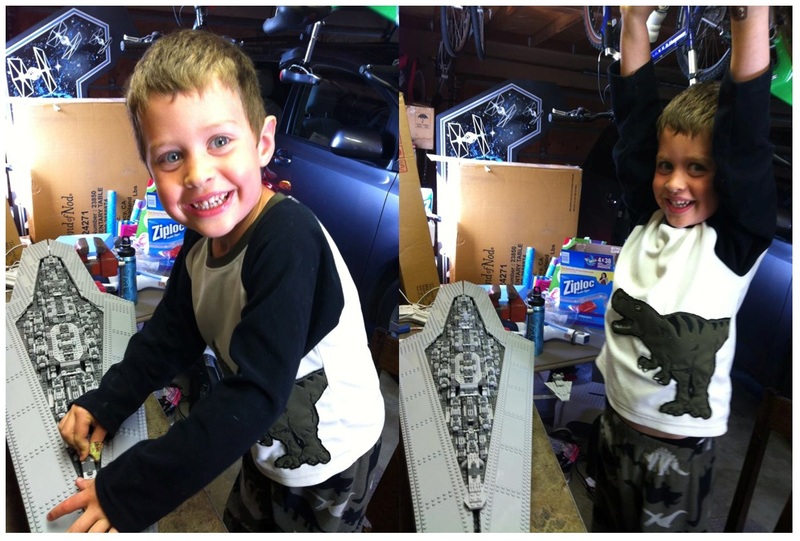 It’s time to finish the Super Star Destroyer.” So we traipsed out to the garage in our pajamas to put the finishing touches on our epic project. I made sure there was plenty of ceremony, taking a picture of him placing the last piece. We all celebrated for breakfast with UnDorkMommy’s amazing special aebleskivers. 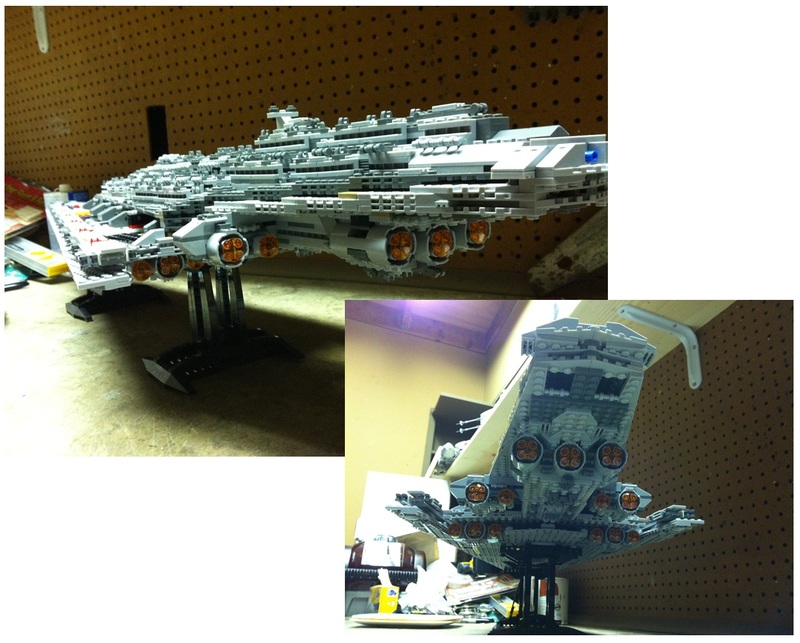 We then hoisted the completed project up on a shelf in the garage specifically built to house it and the Lego Star Wars Xwing, Ywing and Millennium Falcon that came before, where it proudly sits today. Oh, and lest you think that Legos are a boys-only sport in our house, let me put that notion to rest. Title-9 is in full-effect in the DorkDaddy household. 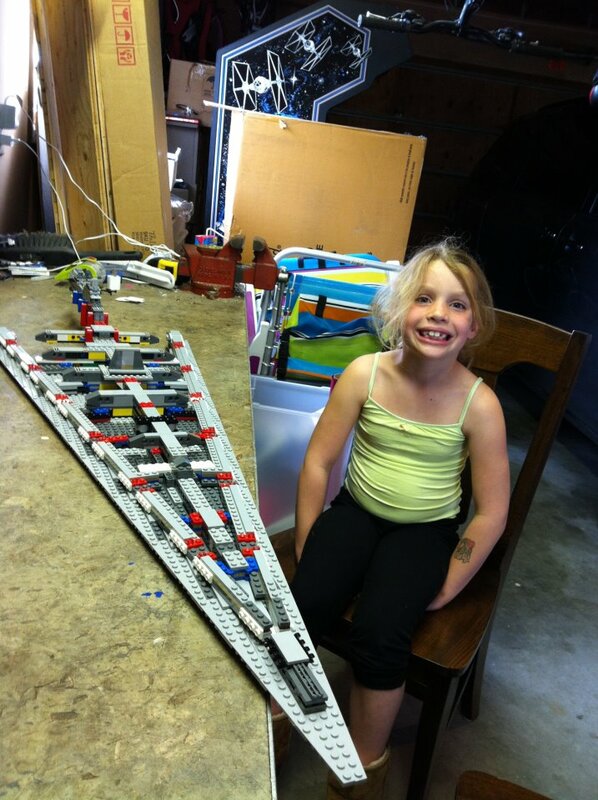 The only difference between Episode V’s Lego experience and Episode IV’s is that Episode IV is a 7-year-old girl. She can do it all by herself, thankyouverymuch. This is great! My boys are graduating out of the build a MASSIVE Thomas Train railway in the living room to Legos. So, Lego summer camp it is. Sadly, I am missing the Lego gene, so we need professional help. Holy guacamole! Is there a Lego summer camp?!?!! Their school is running a week long Lego summer camp put on by the ‘Lego Man’ who has a store in Freighthouse Square in Tacoma. Apparently he is Lego Certified Professional builder. They are pretty stoked! 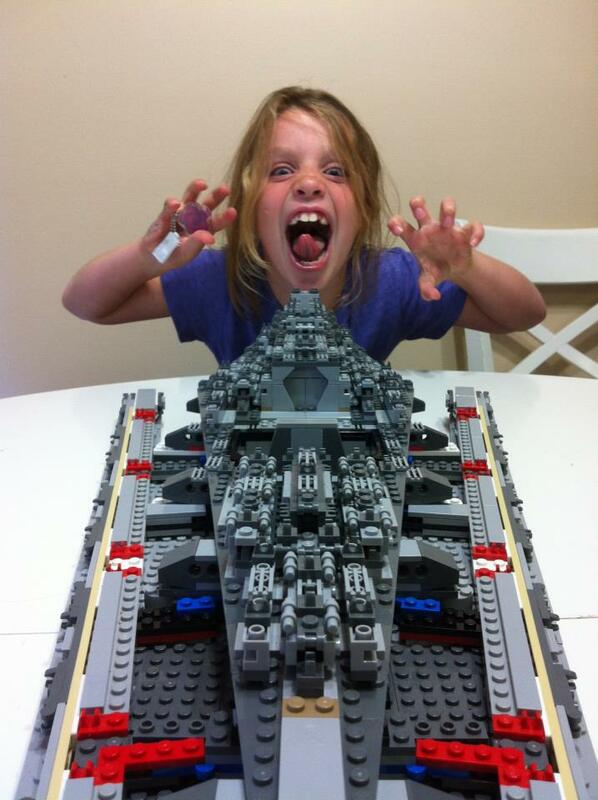 Love your Lego pics. I am saddened by the the kits and gender specific Lego now-a-days. When I grew up my brother and sisters would play with the basic building blocks for hours and hours. Remember the sets that had windows, doors, shingles and tons of wheels and axles? In any case, your children seem to be having a great time!! Great post! You know, I initially baulked at the gender-specific directions that Lego recently took. Many dad-bloggers did too, but I have to say that ultimately it doesn’t really matter. What matters is that kids fall in love with legos and absorb all the educational goodness that comes from playing with them. 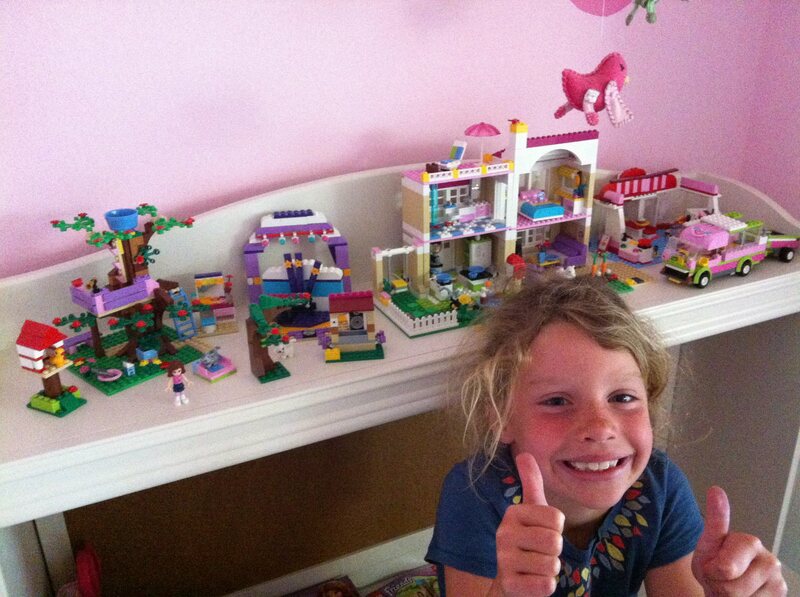 If having “girly” legos is what it took to get my daughter into it, I’m OK with that. My son has bought a few of the “Lego Friends” (i.e. the girl ones) sets and I have no problem with that. What gets me is the lack of the basic building block sets like we played with back in the day. Most of the blocks in today’s sets are specifically made for one design, making it difficult to build anything original . Oh we’re WELL aware. We were actually planning to go there in August, but it looks now like we’re going to have to delay that trip for a year. Terrific post! We are also a Lego obsessed household. Those tiny little plastic pieces have the power to bring us all together. Nice work on all of your designs! I’m the father of Lego-maniac myself. The Lego video games have also been a hit with my son. Hmmmm. That reply went awry didn’t it? I just assumed you were giving me a message in morse code… or binary… or brail. That would be nerdy enough for either of us. That is so awesome. Next year you’ll be building a spaceship together. Who needs NASA, right? My daughter’s only one and change, so maybe it’s a little too early for me to get excited about getting her into Lego. But after reading this post, that ship has sailed. Thanks for getting my day started with visions of project after project!